Susan B. Anthony was a prominent leader in the 19th century women's rights movement. She was co-founder of the first Women's Temperance Movement with Elizabeth Cady Stanton and she also co-founded the women's rights journal, The Revolution. She was a strong advocate of a woman's right to vote and she gave from 75 to 100 speeches a year throughout the United States and Europe. In 1979 Susan B. Anthony became the first woman to appear on a U.S. circulating coin when she replaced President Eisenhower on the one dollar coin. 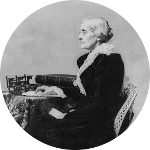 Susan B. Anthony has a number of relatively close cousins that are famous. Presidential connections include Presidents Pierce, Coolidge, Fillmore, both Harrisons and both Bushs. First ladies include Barbara (Pierce) Bush, Lucretia (Rudolph) Garfield, and Eleanor Roosevelt. One of Susan's closest famous kin is patriot Stephen Hopkins, who was a signer of the Declaration of Independence. She is also kin to Benjamin Harrison V, another signer of the Declaration of Independence. Ironically another close relative is Benedict Arnold, first a hero, then later a traitor to the American Revolution. Susan B. Anthony also has a royal connection as she is a cousin to Prince William, Duke of Cambridge, and his mother Princess Diana.